6.2" x 6.2" stitched on 14 count. 4.8" x 4.8" stitched on 18 count. He's Here! 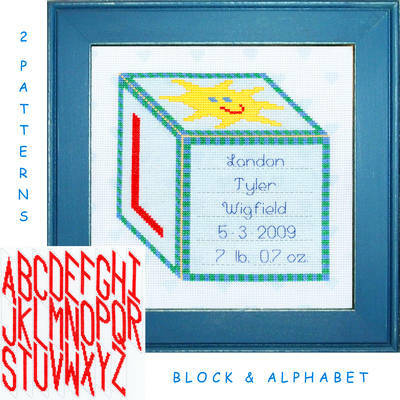 cross stitch pattern... A baby block features personal information, an initial, and a sun on 3 sides. Two alphabets (one 4 pages of additional chart) and a grid for determining spacing are enclosed.